The Easter holidays are now upon us and Juicy Stakes and Intertops Poker are celebrating by holding a pair of special online poker tournaments. For Good Friday, April 14, from 7:15pm New York time, the Horizon Poker Network sites are offering the $2.20 buy-in Easter Bounce competition. Featuring 3,000-chip starting stacks and ten-minute blind levels, this one-off tournament will see a bounty of $0.50 placed on every competitor while there are to be no re-buys or add-ons. As if this wasn’t enough, Intertops Poker and Juicy Stakes will additionally run their Tax Day Freeroll on April 18 from 9:15pm featuring a guaranteed prize pool of $300. Citizens of the United States normally mark April 15 by paying their annual income tax bill but this year’s deadline has been moved to Tuesday due to the Easter holidays, which gave the online poker sites the perfect excuse to hold this freeroll competition. Intertops Poker and Juicy Stakes declared that their Tax Day Freeroll will offer 2,000-chip starting stacks as well as ten-minute blind levels while players will moreover be able to take advantage of unlimited $0.30 re-buys and late registration until 9:45pm. 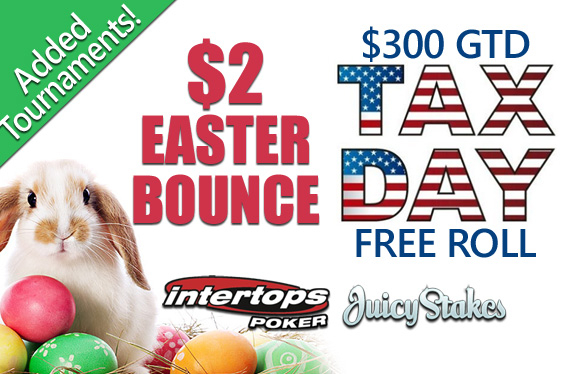 Intertops Poker and Juicy Stakes will hold their $2.20 buy-in Easter Bounce competition on Friday followed by their free-to-enter Tax Day Freeroll on April 18.